Setting up and verifying your self storage business is one of the first prerequisites to a successful local SEO strategy. Claiming and verifying your self storage business’ Google My Business Listing will not only enhance your online branding efforts but also improve the chances of you “getting found” by potential customers through Google Maps, Local Finder, thus enabling better search engine rankings. Google has recently introduced a few changes, rather improvements in the Google My Business (GMB) Listings’ features. A GMB listing is now, more than ever before, a more engaging window to attract new customers for your business. It is no longer about just having a basic name, address phone number listing but also several other valuable additions like Posts, Q&A , Bookings, Menus / Services, Videos, Save etc. that can make your GMB listing more attractive to potential searchers. Many businesses often claim their My Google Listings and then forget about it. What they don't realise is that if they consistently update and optimise their listings, it will enable them to improve their search engine rankings and ultimately their organic traffic. Yes, with a nicely setup GMB listing you can expect more footfalls to your website! This one’s a no brainer, actually! There are a series of questions that Google wants you to answer to get a better idea about your self storage business. Take your time. Every word you write in here has the power to potentially attract a new customer for your business. By the way, if you don't fill out that information, someone else will. How? Many business owners are unaware that there is a “Suggest an edit” option which can be misused by unhappy ex-employees and even your competitors. Now, these are searcher generated changes and go live immediately. There is always a risk that someone with malicious intent may update something unwanted to deliberately harm your business’ reputation. 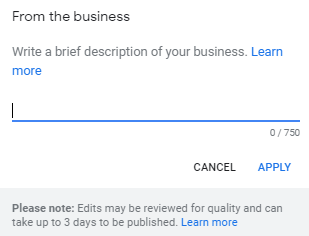 Thus, we strongly recommend you to regularly check and update your Google My Business Listings. What if someone does type something malicious? While a user has the option to write anything good or bad on your GMB listing, you, as the owner, also have an option of accepting or rejecting the same. Here’s how. When you click on “Google Updates,” you'll see a box “Review Updates.” Over here, you can remove incorrect or false information that may have been made by an upset Google user. However,remember that Google may or may not send you notifications about a change on your GMB listing. It is, therefore, advisable that you check the listings frequently in order to ensure accurate information is displayed. Google also encourages people who are familiar with your business to answer questions relevant to your self storage business, so that Google can gain more information about your self storage company. To do this they simply click on the “Know this place? Answer quick questions” link. Once they answer a question, they will be prompted to answer another. It’s now the user’s choice to either answer or choose to decline. Once you have filled out all the necessary details, you need to submit your GMB listing for a verification before it is pushed live and can be accessed by searchers. In any of these verification methods, you will be given a verification code. Once you've entered your code, your business information will be eligible to appear live on Google Maps, Search, and other Google properties. Once your self storage business is claimed and verified on Google My Business Listings, ensure to check your business listing regularly to keep it updated. Wish to setup a GMB listing for your self storage business?